James Pointer was born on November 27, 1815 in Franklin County Missouri as noted in the Goodspeed History of Osage County published in 1888. (Since Gasconade county was not formed until 1820 and Osage in 1841, James birthplace could have been in any of the three) He was the fourth child and second son of George and Joannah (Tackett) Pointer. According to the Goodspeed history of Osage County, Missouri published in the 1880, he was one of the pioneer settlers in Osage county. Tennessee although at present we have found no record. She was the third daughter and sixth child of Thomas Garred and Alma Susan (McGowan) Branson. She lived her early life in Tennessee probably arriving in Missouri in the late 1820's. She first appears on the census records of Missouri in 1830 with her father Thomas. On 10 January 1836 she married James Pointer in Gasconade County. This marriage is recorded in the Missouri Marriage records and was officiated over by Joshua Cox. The 1840 Census has James and Nancy living in Gasconade County Missouri, (Osage County not formed until 1841). George Washington Pointer is one year old. James is living next to his brother Thomas and there are a number of additional people in his household. One female age 50 to 59 is probably his mother Joannah Pointer, one female 15 - 19 is his sister Johanna, there is an additional female 15 - 19 that could be another sister, as there is some debate over how many children Joannah had. There is a recorded sale of property to James on October 1, 1840. The location is Section 36 Township 43-N, Range 8-W 5th Meridian. This places it where the present Linn State Technical College is located. This is probably the farm that son George was born on. The 1850 census has James and family still located at the farm near Linn Missouri. There are now five children, George W., Thomas, John AJ, Charles and Sarah M. It notes that James is a farmer and the value of his real estate is $200.00. It also notes that he can read and write but that Nancy cannot. His brother Thomas is listed above James and it notes that he is a laborer. Thomas was probably living on James farm and working with him. James mother Johanna is part of Thomas's household as well as one sister Elizabeth Roach. In 1854 James again purchased land as recorded in the US General Land Office records. He purchased property at Section 9, Township 42-N Range 7-W Fifth Meridian. This property is farther south and east and is located in the general area that George W. Pointer would have his homestead. The 1860 Census has James located near the Coppers Hill post office in Jefferson Township. The family moved from the original farm to the second property James bought between 1850 and 1860. It notes that his real estate holdings are now worth $1000.00 and personal property is $350.000 there are now seven children at home, Thomas B, John G, Charles, Sarah, Mary, Martha and Mellisa. The four older children attended school during the year. James brother Thomas now has his own farm but is still located nearby. The 1870 census list James, Nancy and five children, Sally, Mary, Martha, Mellissa and Steven B. They are still located at the farm in Jefferson Township, Osage County. George, James and Nancys oldest son is located on the next farm. It is noted that James real estate is now worth $5000.00 and his personal property is worth $577.00. The census also notes that the three youngest children attended school during the year and that Nancy and Mary cannot read or write. It also notes that Mary cannot speak (Dumb). In 1876, James is listed in the Missouri State Census, listed with him are Nancy, Mary, Melissa and H. James owns 1 horse, 2 mules, 6 cattle, 18 Sheep and 10 hogs. During the year he produced 65 # wheat, 400 # corn and 50 # oats as well as 55 # of wool. The 1880 census has James and Nancy with Melissa and Stephen still at home and notes that Stephen attended school during the year. The census also notes that James is farming and that he was born in Missouri, his father was born in Kentucky and his mother was born in North Carolina and that Nancy is keeping house and was born in Tennessee and that her parents were both born in Virginia. 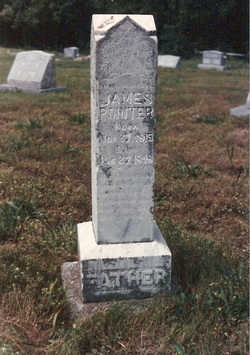 James dies on December 27, 1898 and is buried at College Hill Cemetery, near his farm. His stone notes "Our father has gone to the mansion of rest, to the glorious land by the deity blessed". that she was born in Tennessee and that her Father was born in Kentucky (incorrect) and her mother in Tennessee (incorrect). These inconsistencies are probably due to the person providing the information not knowing the correct birthplaces. 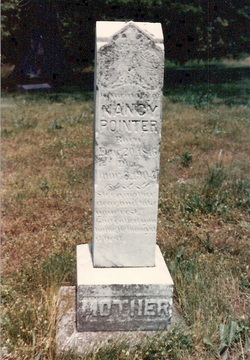 Nancy dies on February 20 1904 and is buried at College Hill Cemetery nears Coppers Hill, Missouri. Nancy's memorial reads Sleep mother dear, take your rest. God called you home, he thought it best.